The Lockheed Martin C-130J "Super" Hercules is a four-engine turboprop military transport aircraft. The C-130J is a comprehensive update of the venerable Lockheed C-130 Hercules, with new engines, flight deck, and other systems. The Hercules family has the longest continuous production run of any military aircraft in history. During more than 50 years of service, the family has participated in military, civilian, and humanitarian aid operations. The Hercules has outlived several planned successor designs, most notably the Advanced Medium STOL Transport contestants. Fifteen nations have placed orders for a total of 300 C-130Js, of which 250 aircraft have been delivered as of February 2014[update]. The C-130J is the newest version of the Hercules and the only model still in production. Externally similar to the classic Hercules in general appearance, the J-model features considerably updated technology. These differences include new Rolls-Royce AE 2100 D3 turboprops with Dowty R391 composite scimitar propellers, digital avionics (including head-up displays (HUDs) for each pilot), and reduced crew requirements. These changes have improved performance over its C-130E/H predecessors, such as 40% greater range, 21% higher maximum speed, and 41% shorter takeoff distance. The J-model is available in a standard-length or stretched -30 variant. As a cargo and airlift aircraft, the C-130J's crew includes two pilots and one loadmaster (no navigator or flight engineer), while specialized USAF variants (e.g., AC-130J, MC-130J, HC-130J) may have larger crews, such as navigators/Combat Systems Officers. The U.S. Marine Corps KC-130J uses a crew chief for expeditionary operations. The C-130J's cargo compartment is approximately 41 feet (12.5 m) long, 9 feet (2.74 m) high, and 10 feet (3.05 m) wide, and loading is from the rear of the fuselage. The aircraft can also be configured with the "enhanced cargo handling system". The system consists of a computerized loadmaster's station from which the user can remotely control the under-floor winch and also configure the flip-floor system to palletized roller or flat-floor cargo handling. Initially developed for the USAF, this system enables rapid role changes to be carried out and so extends the C-130J's time available to complete taskings. Lockheed Martin received the launch order for the J-model from the RAF, which ordered 25 aircraft, with first deliveries beginning in 1999 as Hercules C4 (C-130J-30) and Hercules C5 (C-130J). The standard C-130J had a flyaway cost of US$62 million in 2008. In mid-June 2008, the United States Air Force awarded a $470 million contract to Lockheed Martin for six modified KC-130J aircraft for use by the Air Force and Special Operations Command. The contract led to C-130J variants that will replace aging HC-130s and MC-130s. The HC-130J Combat King II personnel recovery aircraft completed developmental testing on 14 March 2011. The final test point was air-to-air refueling, and was the first ever boom refueling of a C-130 where the aircraft’s refueling receiver was installed during aircraft production. This test procedure also applied to the MC-130J Combat Shadow II aircraft in production for Air Force Special Operations Command. 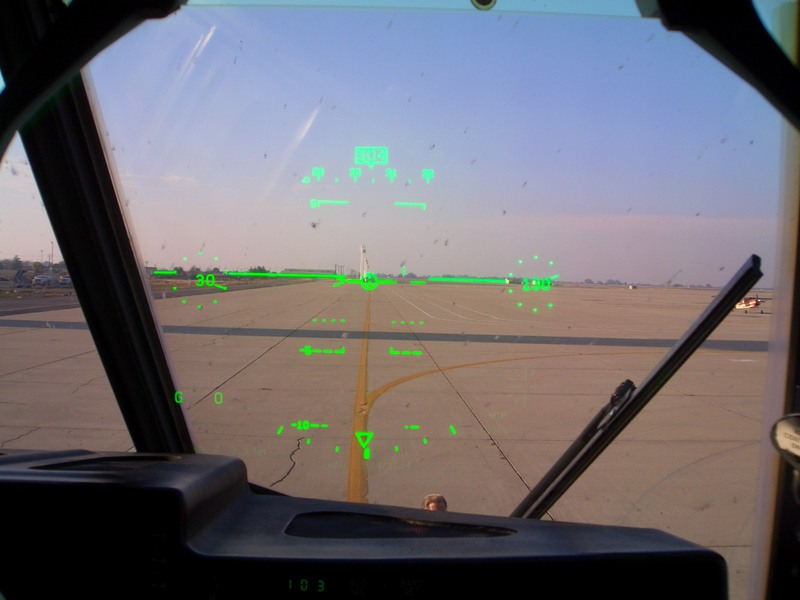 A KC-130J showing the AN/AAQ-30 Targeting Sight and AGM-114 Hellfires on the left wing in Afghanistan, 2011. With the addition of the Marine Corps's ISR / Weapon Mission Kit, the KC-130J tanker variant will be able to serve as an overwatch aircraft and can deliver ground support fire in the form of Hellfire or Griffin missiles, precision-guided bombs, and eventually 30mm cannon fire in a later upgrade. This capability, designated as "Harvest HAWK" (Hercules Airborne Weapons Kit), can be used in scenarios where precision is not a requisite, such as area denial. The aircraft retains its original capabilities in refueling and transportation. The entire system can be removed within a day if necessary. The Super Hercules has been used extensively by the USAF and USMC in Iraq and Afghanistan. Canada has also deployed its CC-130J aircraft to Afghanistan. C-130Js from several countries have been deployed in support of the US Operation Odyssey Dawn and NATO's Operation Unified Protector during the 2011 Libyan civil war. From the first flight on 5 April 1996 to 30 April 2013, 290 C-130J Super Hercules aircraft operated by 13 nations surpassed 1 million flight hours. In January 2013, it was reported that some of Canada's C-130J transports have counterfeit Chinese microchips in their cockpit displays. These parts are more likely to fail and cause such results as blank instrument screens during flight. On 20 August 2013, the Indian Air Force performed the highest landing of a C-130J at the Daulat Beg Oldi airstrip in Ladakh at the height of 16614 feet (5065 meters). The Modular Airborne FireFighting System (MAFFS) is a self-contained unit used for aerial firefighting that can be loaded onto a C-130 Hercules, which then allows the aircraft to be used as an air tanker against wildfires. This allows the U.S. Forest Service (USFS) to utilize military aircraft from the Air National Guard and Air Force Reserve to serve as an emergency backup resource to the civilian air tanker fleet. The latest generation MAFFS II system was used for the first time on a fire in July 2010, using the C-130J Super Hercules. The 146th Airlift Wing was the first to transition to the MAFFS II system in 2008, and it remains the only unit flying the new system on the C-130J aircraft. The largest operator of the new model is the U.S. Air Force, which has ordered the aircraft in increasing numbers. Current operators of the C-130J are the USAF (to include the Air Force Reserve Command and the Air National Guard), United States Marine Corps (being their fourth variant after KC-130F, KC-130R and KC-130T,) United States Coast Guard, Royal Air Force, Royal Canadian Air Force, Royal Australian Air Force, Danish Air Force, Royal Norwegian Air Force, Indian Air Force and the Italian Air Force. As of July 2010, a total of 200 units have been produced of the 284 on order at that time. Australia was the second international customer for the C-130J-30, with an initial order of twelve aircraft. An additional order for two more aircraft was planned, but cancelled with the purchase of a fifth Boeing C-17 Globemaster III. Lockheed Martin offered to lease four C-130Js to the German Luftwaffe in 2005. Germany was awaiting the replacement of its Transall C-160 by Airbus A400Ms, but that was planned for 2010. The deal would have filled in the gap in airlift capability, but the offer was declined. The Royal Norwegian Air Force ordered four C-130J-30s in 2007 to replace six aging C-130Hs in need of additional repairs. Aircraft were delivered from November 2008 to 2010. One of these was lost in March 2012. The Canadian Forces signed a US$1.4 billion contract with Lockheed Martin for seventeen new C-130J-30s on 16 January 2008, as part of the procurement process to replace the existing C-130E and H models. The C-130J will be officially designated CC-130J Hercules in Canadian service. The first C-130J was delivered to CFB Trenton on 4 June 2010. The final C-130J was delivered on 11 May 2012. The Indian Air Force purchased six C-130J-30s in early 2008 at a cost of up to US$1.059 billion for its special operations forces in a package deal with the US government under its Foreign Military Sales (FMS) program. India has options to buy six more aircraft. The Indian government decided not to sign the Communications Interoperability and Security Memorandum of Agreement (CISMOA), which resulted in the exclusion of high precision GPS and other sensitive equipment. However the IAF added similar equipment produced indigenously, to the aircraft after delivery. In October 2011, India announced its intent to exercise the option for the six additional aircraft, following the favorable performance of the C-130J in the 2011 Sikkim earthquake relief operations. In July 2012 the U.S. accepted India's request for sale of six more C-130Js through the FMS program. C-130J was also extensively used in the rescue operations of Uttarakhand floods. The Iraqi Air Force ordered six C-130J-30s in July 2008. Qatar ordered four C-130Js in October 2008, along with spare parts and training for the Qatar Emiri Air Force. The contract is worth a total of US$393.6 million and deliveries are scheduled to begin in 2011. In June 2009, Lockheed Martin said that both the UK and France had asked for technical details on the C-130J as an alternative to the troubled Airbus A400M. The United Arab Emirates Air Force announced an order for twelve C-130J transports at the 2009 IDEX, with an announced value of US$1.3 billion. The United Arab Emirates requested 12 C-130Js through a Direct Commercial Sale in December 2009, with logistics support, training and related systems to be provided through a Foreign Military Sales program. A contract with Lockheed Martin has not been signed. The Israeli Air Force is seeking to purchase nine C-130J-30s. In April 2010 Israel ordered one C-130J-30 with delivery in 2013, and was in contract talks for two more aircraft in June 2010. [N 1] An option for a second C-130J-30 was exercised on 8 April 2011, along with planning and advance long lead procurement of aircraft components to support the third C-130J Israeli aircraft. The first Israeli C-130J, nicknamed "Shimshon," was delivered on 26 June 2013. It will be modified with Israeli-unique systems and enter service in spring 2014. Israel ordered a fourth C-130J-30 on 25 July 2013. The Kuwait Air Force signed a contract for three KC-130J air refueling tankers in May 2010, with deliveries to begin in late 2013. The KC-130Js will extend the range of its F-18s and augment its fleet of three militarized L-100s. Oman increased its C-130J order in August 2010 by adding two C-130Js to the single C-130J-30 ordered in 2009. Deliveries are to be completed by early 2014. The Mexican Government has requested 2 C-130J-30s. The Mongolian Air Force is planning to buy 3 C-130Js. On 7 June 2013, Congress was notified of a possible foreign military sale of 2 C-130J-30 transports for the Free Libyan Air Force. The deal would include 10 Rolls-Royce AE 2100D3 engines, support and test equipment, and radios. The deal would be worth $588 million. In July 2013, the C-130J became part of a competition in the Peruvian Air Force for a medium transport aircraft. The Super Hercules is a candidate along with the EADS CASA C-295, the Alenia C-27J Spartan, the Antonov An-70, and the upgraded Antonov An-32. Lockheed Martin designation for its 15 ft (4.6 m) extended fuselage variant. Variant for the Air Force Special Operations Command, operated by the Pennsylvania Air National Guard. Long range patrol and air-sea rescue variant for the United States Coast Guard. USAF HC-130J version has changes for in-flight refueling. Aerial refueling tanker and tactical airlifter version for United States Marine Corps. Designed for Air Force Special Operations Command. Originally named Combat Shadow II. Weather reconnaissance ("Hurricane Hunter") version for the Air Force Reserve Command. A civilian version of the C-130J-30 was under development, but the program was placed on hold indefinitely to focus on military development and production. Indian Air Force - 12 C-130J-30s ordered by 2011, with six C-130J-30s in service as of January 2013. Israeli Air Force to acquire nine C-130J-30s. Four on order, with first delivery in spring 2013. Royal Air Force of Oman - one C-130J-30 in use as of January 2013. Two more C-130Js on order with delivery by early 2014. Tunisian Air Force - one C-130J-30 in service as of January 2013. One more C-130J-30 on order with delivery in 2014. On 12 February 2007, RAF Hercules C.4 C-130J-30 ZH876, c/n 5460, seriously damaged during landing, no casualties. On 15 March 2012, Royal Norwegian Air Force C-130J-30, 10-5630, c/n 5630, on a flight from Evenes, Norway to Kiruna, Sweden, impacted the side of Kebnekaise mountain, and disintegrated. All five aboard were confirmed dead. The aircraft was to collect soldiers and fly back to the Norwegian base for the NATO exercise "Cold Response". A C-130J Super Hercules cleaned in the wash system at Keesler Air Force Base, Mississippi. Specifications are for basic J-model; data for C-130J-30 noted. ↑ Quote: "Separately, Israel has held preliminary talks with Lockheed Martin about acquiring more C-130J tactical transports. The nation will receive its first example in mid-2013 ..."
↑ "250TH C-130J Super Hercules Built Is Delivered." Lockheedmartin.com, 16 February 2012. Retrieved: 21 August 2012. 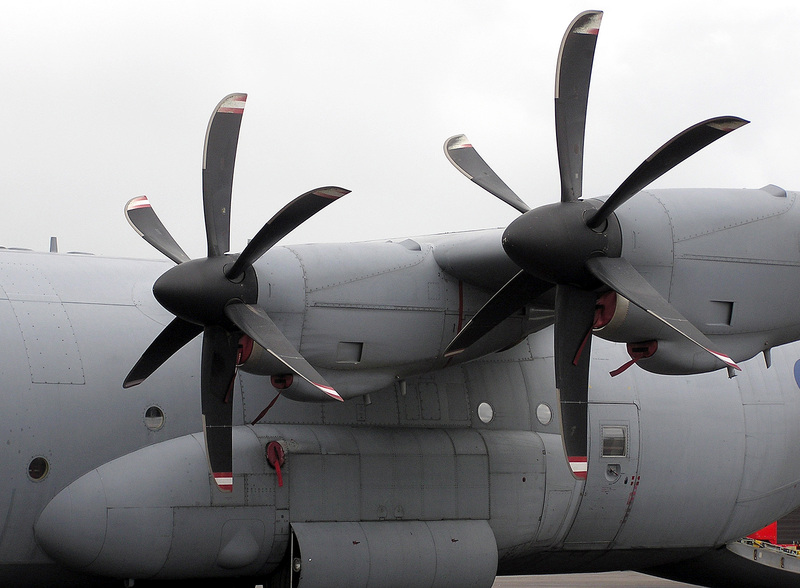 ↑ "C-130J Advanced propeller system (six-blade R391 propeller)." Dowty Propellers. Retrieved: 31 July 2009. ↑ 4.0 4.1 Eden 2004. ↑ "C-130J Spec Book." cc-130j.ca. Retrieved: 1 August 2010. ↑ "FY 2009 Budget Estimates." United States Air Force via saffm.hq.af.mi, February 2008, p. 81. ↑ Trimble, Stephen. "Lockheed Martin C-130J selected for new special operations role." Flightglobal, 18 June 2008. Retrieved: 17 July 2010. ↑ "HC-130J Completes Developmental Testing." Lockheed Martin Press Release, 22 March 2011. ↑ "General James T. Conway on The Posture of the United States Marine Corps. "[dead link] zumwaltfacts.info, 14 May 2009. Retrieved: 1 August 2010. ↑ McCullough, Amy. "Refuel and Fire." Marine Corps Times, 1 June 2009. ↑ Flurry, SSgt Christopher. "KC-130J Harvest Hawk: Marine Corps teaches old plane new tricks in Afghanistan." 2nd Marine Aircraft Wing (Fwd), United States Marine Corps, Camp Dwyer, Afghanistan, 1 April 2011. Retrieved: 5 April 2011. ↑ Weston, Greg. "Fake parts in Hercules aircraft called a genuine risk." CBC News, 9 January 2013. ↑ "IAF's C-130J transporter lands near India-China border". 20 August 2013. http://www.business-standard.com/article/news-ians/iaf-s-c-130j-transporter-lands-near-india-china-border-113082000835_1.html. Retrieved 20 August 2013. ↑ "10 reasons why IAF's C-130J Super Hercules landing in Daulat Beg Oldie, Ladakh is important Read more at: http://indiatoday.intoday.in/story/indian-air-force-super-hercules-c-103j-landing-daulat-beg-oldie-ladakh-china/1/300410.html". 20 August 2013. http://indiatoday.intoday.in/story/indian-air-force-super-hercules-c-103j-landing-daulat-beg-oldie-ladakh-china/1/300410.html. Retrieved 20 August 2013. ↑ 17.0 17.1 "Modular Airborne FireFighting System (MAFFS)." U.S. Forest Service, 19 March 2008. Retrieved: 9 October 2010. ↑ "Modular Airborne FireFighting Systems (MAFFS)". U.S. Forest Service, 24 June 2008. Retrieved: 9 October 2010. ↑ Gabbert, Bill. "New MAFFS II used for first time on a fire." Wildfire Tody, 16 July 2010. Retrieved: 9 October 2010. ↑ 20.0 20.1 Krenke, Lt. Col. Ellen. "MAFFS responds to brush fires in California." national Guard, 16 July 2010. Retrieved: 9 October 2010. ↑ Pike, John, "KC-130J." Globalsecurity.org. Retrieved: 17 July 2010. ↑ "Major Program Milestone Demonstrates Success For Lockheed Martin C-130J Super Hercules Program." Lockheed Martin, 20 July 2010. Retrieved: 10 August 2010. ↑ Kemp, Ian. "Farnborough 2010: Lockheed Martin looks to sell another 250 C-130J." Shephard, 21 July 2010. Retrieved: 10 August 2010. ↑ "Australian Budget 2011-2012". Budget.australia.gov.au. Retrieved: 21 August 2012. ↑ Leersch, Hans-Jürgen. "Neue Truppentransport-Maschinen für die Bundeswehr." Welt Online, 2 June 2005. ↑ "Norway to Renew Tactical Transport Fleet." Defense Industry Daily, 23 November 2009. ↑ Trine, Jung Ling. "Contract for new transport planes signed." Norwegian Defence Force website, 29 June 2007. ↑ Lunde, Caroline. "Work horse back in business." Norwegian Defence Force website, 25 November 2008. ↑ Hoyle, Craig. "Norway takes delivery of first Lockheed Martin C-130J." Flight International, 17 November 2008. ↑ "Last Super Hercules comes to Norway." Theforeigner.no, 4 July 2010. Retrieved: 21 August 2012. ↑ Warwick, Graham. "Canada signs $1.4bn contract for 17 Lockheed Martin C-130Js." Flight International, 16 January 2008. Retrieved: 17 January 2008. ↑ "PWGSC announces next step in procuring tactical airlift fleet." Public Works and Government Services Canada, 3 August 2007. Retrieved: 8 August 2007. ↑ "New generation of CC-130J Hercules arrives in Canada." Canada's Air Force, 4 June 2010. Retrieved: 2 October 2010. ↑ "Final CC-130J Hercules Transport Aircraft Delivery Ahead of Schedule. "Canada's Air Force, 11 May 2012. Retrieved: 11 May 2012. ↑ "India – C-130J Aircraft." Defence Security Cooperation Agency, 25 May 2007. ↑ "India signs agreement for Hercules aircraft. "[dead link] Indian Defense Research Wing, 6 February 2008. ↑ "U.S. Dilutes Defence Technology to India." India Defence Online, August 2010. ↑ "US accepts India's request for supplying 6 more C-130J planes." The Economic Times, 20 July 2012. Retrieved: 21 July 2012. ↑ "Iraq: C-130J-30 Aircraft." Defense Security Cooperation Agency, 25 July 2008. ↑ 40.0 40.1 "Iraq Orders C-130Js." Defense Industry Daily, 12 August 2009. ↑ "Lockheed to Supply Planes to Qatar." Washington Post, 8 October 2008, p. D4. ↑ Lococo, Edmond and Andrea Rothman. "U.K., France Seek Data on Super Hercules Plane, Lockheed Says." Bloomberg, 14 June 2009. Retrieved: 17 July 2010. ↑ "UAE Buys C-17s, Seeks C-130Js." Defenseindustrydaily.com, 21 September 2010. Retrieved: 26 February 2011. ↑ "United Arab Emirates - Logistics Support and Training for 12 C-130J-30 Aircraft." US Defense Security Cooperation Agency, 28 December 2009. ↑ "Lockheed expects delays for Middle East aircraft orders." FlightGlobal, 3 May 2011. ↑ "Israel: C-130J-30 Aircraft." asd-network.com. Retrieved: 17 July 2010. ↑ Egozi, Arie. "Israel ditches Apache upgrade plan, commits to CH-53K." Flightglobal.com, 30 June 2010. Retrieved: 1 August 2010. ↑ "US DOD Contract No. 286-11." United States Department of Defense, 8 April 2011. ↑ 49.0 49.1 "Israel Acquires Additional Lockheed Martin C-130J Super Hercules." Lockheed Martin, 28 April 2011. ↑ "Pentagon contract announcements." Defense.gov, 25 July 2013. ↑ 51.0 51.1 "Lockheed Martin Awarded Contract for Kuwait Air Force KC-130J Tankers." defpro.com, 27 May 2010. Retrieved: 17 July 2010. ↑ 52.0 52.1 Parsons, Gary. "Oman orders extra C-130Js." AirForces Monthly, 25 August 2010. Retrieved: 25 August 2010. ↑ "Mexico – C-130J-30 Aircraft." Defense-aerospace.com. Retrieved: 16 August 2013. ↑ "Mongolia planning to buy U.S. Military airplanes." EurasiaNet.org, 27 March 2013. Retrieved: 16 August 2013. ↑ "US notifies Congress of potential Libyan C-130J sale." Flightglobal.com, 11 June 2013. ↑ "Peru; Four contenders in the next generation transport aircraft tender." -Dmilt.com, 30 July 2013. ↑ "1998 Annual Report for Lockheed Martin Corporation." Lockheed Martin. Retrieved: 28 August 2012. ↑ "Lockheed Martin Corporation Report Fourth Quarter 1999 Net Earnings." Lockheed Martin, 28 January 2000. ↑ "Lockheed Martin Reports 2001 Earnings." Lockheed Martin, 25 January 2002. ↑ "Lockheed Martin Completes C-130J Deliveries for 2001." Lockheed Martin Press Release. Retrieved: 16 April 2011. ↑ 61.0 61.1 "Lockheed Martin Reports 2003 Results." Lockheed Martin, 27 January 2004. ↑ "Lockheed Martin Announces 2004 Fourth Quarter And Year-End Results." Lockheed Martin, 27 January 2005. ↑ "Lockheed Martin Prepares to Deliver Two More New C-130J Aircraft to the Hercules Center of Excellence in Little Rock." cc-130j.ca, 20 December 2005. ↑ "Lockheed Martin Corporation 2006 Annual Report." Lockheed Martin. Retrieved: 4 May 2011. ↑ 65.0 65.1 "Lockheed Martin Announces 2008 Fourth Quarter And Year-End Results." Lockheed Martin, 22 January 2009. ↑ "Lockheed Martin Announces Fourth Quarter And Year-End Results." Lockheed Martin, 28 January 2010. ↑ "Lockheed Martin Announces Fourth Quarter 2010 Results." Lockheed Martin, 27 January 2011. ↑ Simmons, Peter. "More Lockheed Martin C-130J Aircraft Now on Contract." Lockheed Martin, March 2002. ↑ Frawley, Gerald. "The Lockheed L-100 Hercules." Airliners.net, 2010. Retrieved: 10 February 2011. ↑ Pugliese, David . "A Maritime Version of the C-130J Hercules– Will It Sell?" Ottawa Citizen, 2012. Retrieved: 20 September 2012. ↑ 71.00 71.01 71.02 71.03 71.04 71.05 71.06 71.07 71.08 71.09 71.10 71.11 71.12 "World Military Aircraft Inventory". 2013 Aerospace. Aviation Week and Space Technology, January 2013. ↑ Kuglin, Ernst. "Flying high for 50 years." Belleville Intelligencer, 19 November 2010. Retrieved: 3 December 2010. ↑ "India Buys C-130J-30 Hercules for Special Forces." Defenseindustrydaily.com, 26 December 2011. ↑ "IAF to deploy Six C-130J transport aircraft in Orissa." IBN Live. Retrieved: 28 August 2012. ↑ "Final three C-130Js for Iraq set for delivery." Shephardmedia.com, 2 May 2013. Retrieved: 16 August 2013. ↑ Eshel, David. "Israel Considers Renewing its C-130 Fleet with C-130J-30." Aviation Week, 8 November 2008. ↑ "Mexico requests C-130J-30 aircraft from us." Airforce-Technology.com, 27 September 2012. Retrieved: 21 April 2013. ↑ "Government to spend $588 million on US military transport planes." Libya Herald. Retrieved: 16 August 2013. ↑ Kinder, Brian. "South Korea Super Hercules." codeonemagazine.com, 2 December 2010. Retrieved: 10 February 2011. ↑ "Tunisia Orders C-130J Super Hercules Airlifters." Defense Talk, 4 March 2010. Retrieved: 17 July 2010. ↑ "Aircraft registration ZH876." airframes.org. Retrieved: 21 July 2012. ↑ "MoD 'covered up' Hercules bombing." BBC, 18 March 2008. Retrieved: 21 July 2012. ↑ Ritter, Karl. "5 confirmed dead in Sweden plane crash." The Atlanta Journal-Constitution, 17 March 2012. ↑ Hoyle, Craig. "Norway, Sweden investigate 'mystery' C-130J." Flight Global, 19 March 2012. Retrieved: 23 March 2012. ↑ "Fact sheet: USAF C-130 Hercules." af.mil, October 2009. Retrieved: 13 December 2009. ↑ Frawley 2002, p. 108. ↑ "Altitude." C-130J/CC-130J. Retrieved: 23 March 2012. Wikimedia Commons has media related to C-130J Hercules.